When the weather meteorologists start to warn us of a hurricane, our first instinct is to ask ourselves the question: How can we prepare? If you are near the coast or in the direct path, you may start purchasing items to secure your home. In addition to worrying about your home, you also must think about your outside belongings. It may be your storage building, RV or even a boat. Ron, from North Carolina is a return customer of ours, purchasing covers for both of his boats. When he first heard of the upcoming storm, he made sure that his covers were tied down securely. With a large storm, you never know what damage may occur. Check out his images! His boat covers weathered the storm perfectly fine! He has the covers supported with support poles to prevent pooling of water, allowing the water to run off. Since each are tied down properly to the trailer, he did not risk the covers blowing off during the storm. The Carolina Skiff cover was approximately 2 years old at the time of the storm and the Sea Dolphin cover is about 2 months ago. No matter the age, both covers protected the boats beautifully during the hurricane. With large storms, you never know what to expect! Ron’s boats and covers fared well during this scary time. 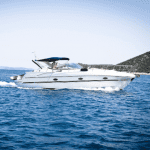 Consider covering your own boat or car with one of our protective covers to prevent storm damage.